Lucinda Williams certainly takes her time between albums. Her debut was an acoustic blues collection that was issued on the Folkways label. 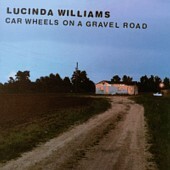 Nineteen years have passed, and many artists and musical fads have come and gone, yet Williams has just now gotten around to releasing her fifth album Car Wheels on a Gravel Road. It's not that Williams hasn't been busy. She's just a perfectionist. Car Wheels on a Gravel Road took an astounding six years to make. During that time, Williams changed producers on several occasions and went so far as to record the entire album from scratch — twice. Often, this much turmoil during the recording process can leave an artist with little to show for the time and effort that they put into a project. Amazingly, Williams' obsessive attention to detail has paid off tremendously, and Car Wheels on a Gravel Road is a superb album that churns through a gritty mixture of country, blues, and folk music. Throughout the endeavor, Williams conjures the essence of Bonnie Raitt's music, though she blends it with a Byrds-ian jangle and the punch of alt-country. Performing on the outing are Steve Earle, Emmylou Harris, long-time Joni Mitchell associate Greg Liesz on guitar and mandolin, and E Street Band member Roy Bittan, whose accordion and keyboard performances perfectly complement Williams' earthy intonations. The feelings reflected in Williams' lyrics are honest and true, and her voice exudes emotion — even when she's trying to contain it. There's a bitterness that bubbles just beneath the surface of Drunken Angel, and with each passing lyric it sounds as if Williams is slowly coming unglued. The same can be said of the desperate blues on her version of Randy Weeks' I Can't Let Go or the driving intensity of Joy. The songs just ooze with the raw emotion of an exposed nerve. At times, Williams' country drawl gives the songs a casual air. The reflective title-track and the road-weary Jackson sound as if they are sung from her back porch. In addition, her flawless delivery certainly puts today's top-selling vocalists in their place. One listen to Williams' breathtaking vocals is enough to draw attention to the places where so many other singers have gone so horribly wrong. Williams sings where others scream. She knows when to pause for the best effect, and she packs a lifetime of experience into each creak in her voice.